With the success of VIRTUES I in August and growing interest in UAVs across Virginia, 4-VA at JMU is pleased to announce VIRTUES II. The 2017 summit will focus on one of the primary needs identified at VIRTUES I—strategic coordination between academia and industry. In order to match student capacities to industry needs and requirements, we must first clarify those needs and requirements. In 2015, 4-VA at JMU began building a statewide network to develop undergraduate courses that give students the skills to build and develop UAVs to solve real world problems. Since then, two additional Virginia universities have joined the courses through telepresence. With this infrastructure in place, it’s an opportune time for professionals to inform curriculum with their current and anticipated needs. Our goal is to develop experienced UAV leaders and establish Virginia as the nation’s premier provider of the top candidates in these emerging technologies. We invite administrators, faculty and students from universities across the commonwealth, industry professionals who are eager to advise undergraduate curriculum with their needs, and anyone else interested in these topics. Parking for both days will be available in lot R-2. This will be the parking lot next to Starbucks off Port Republic Road. A map of parking lots can be found here (R-2 is in square A-8). No parking permits will be necessary. Signs will be posted to guide you across the street to Lakeview Hall. Terry McAuliffe is the 72nd Governor of Virginia. Governor McAuliffe’s top priority is building a new Virginia economy. He has conducted 22 trade missions, including two to China, personally delivering Virginia’s calling card to business leaders around the globe. As a result, he is bringing thousands of jobs and more than $14 billion in capital investment to communities across the Commonwealth, which is more than any previous governor in the first 36 months in office. To ensure that Virginia remains competitive, the Governor is implementing major economic development initiatives designed to strengthen the Commonwealth’s pro-business climate, ensure efficient investment in world-class infrastructure and develop a 21st century workforce capable of meeting the needs of emerging businesses and industries. Governor McAuliffe has won bipartisan support for historic investments in public education. He also successfully secured passage of a law establishing a pay-for-performance workforce training program, the first of its kind in the nation. Virginia is home to nearly 800,000 veterans, and the Governor is committed to fighting for those who have served their country. He expanded the Virginia Values Veterans initiative, which encourages employers to recruit, hire, train and retrain veterans. He also worked to facilitate partnerships that increase Virginia veterans’ access to health care. And he led Virginia to become the first state in the nation to functionally end veteran homelessness. Governor McAuliffe is making unprecedented progress on the restoration of civil rights to rehabilitated felons who have completed their sentences and paid their debt to society. He serves as Chairman of the National Governors Association, using that leadership position to assist states as they strengthen their cybersecurity policies and infrastructure. He also is appointed by the President to NGA’s Council of Governors to provide advice on national security matters. 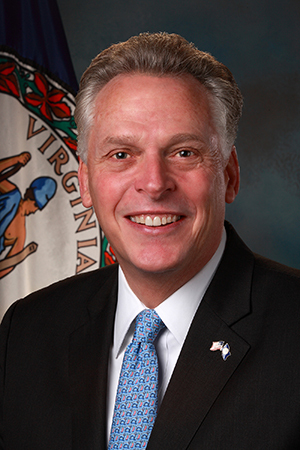 Governor McAuliffe attended Catholic University and Georgetown Law School. He and his wife Dorothy were married in 1988 and have five children.